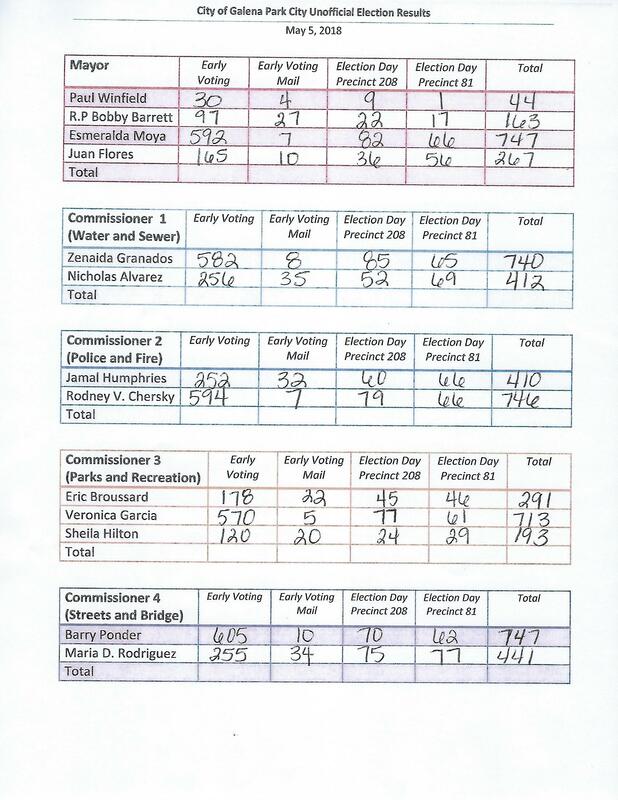 Incumbent Mayor Esmeralda Moya, and her slate of candidates, in unofficial results, received a strong majority of the votes in Saturday’s municipal election. In the Mayor’s race there were four candidates, but none showed a strong following compared with Moya, who received 747 votes out of a total of 1221, for a percentage of 61%. The next closest was Juan Flores, with 267 votes. Elected for Commissioner Position 1 was Zenaida Granados with 740 votes. Elected for Commissioner Position 2 was Rodney Chersky with 746 votes. Elected for Commissioner Position 3 was Veronica Garcia with 713 votes. Elected for Commissioner Position 4 was Barry Ponder with 747 votes. Of the losing candidates, it was noteworthy that former Mayor Bobby Barrett only received 163 votes for a 3rd of 4 candidates for the position. Incumbent Commissioner Rodney Chersky moved from Position 1 to Position 2, and incumbent Commissioner Broussard was defeated for Position 3. Incumbent Commissioner Position 4 Ponder had 747 total votes, the same as the Mayor. For Position 4, Maria Rodriguez had the highest vote total of any of the losing candidates, with 441 total.